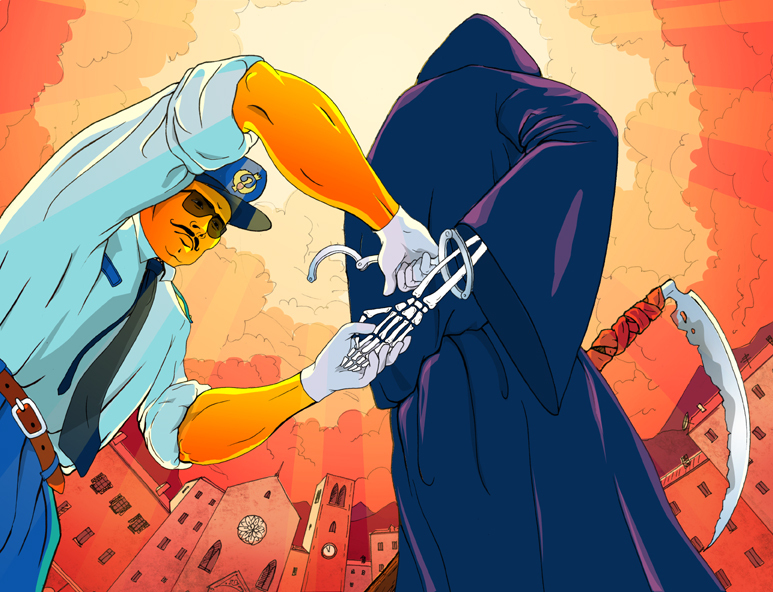 Starting this month it has been illegal to die in a tiny Italian town Falciano del Massico. Apparently, they don't have a cemetery, and not eager to get one. I was working on this illustration for a few days, but I still wasn't satisfied with the result, until this morning, when the new Illustration Friday theme was announced. "Shades, - I thought, - what a brilliant idea," - and I gave my policeman a nice distinctive pair of shades. And they made the picture! Haha, nice! But how long exactly can a pair of steel handcuffs hold back death? Very cool illustration. Love the perspective! Thank you for commenting, guys! Creations By Mit: thank you for noticing, I did put a lot of thoughts into the perspective!